COIL FRESH | Pro Chem, Inc. 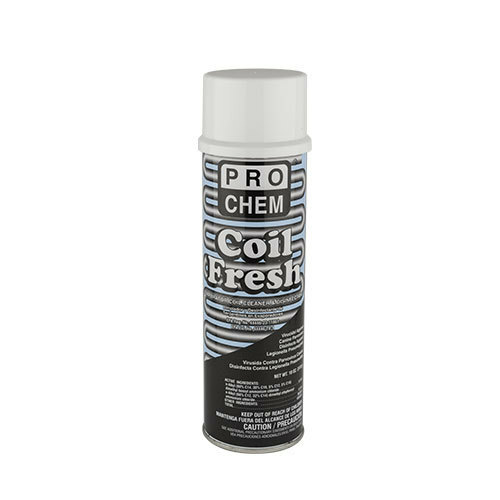 COIL FRESH is a nonabrasive, one-step disinfectant cleaner for evaporator coils in small air conditioners, commercial air handling equipment, HVAC cooling coils and refrigeration equipment. 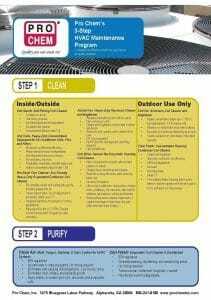 It is effective against a wide variety of organisms and is EPA registered for HVAC applications. The water-based foam dissipates and runs off the coils into the catch pan where, after ten minutes of contact time, COIL FRESH disinfects the catch pan surface, controlling the listed organisms, including the bacteria that cause Legionnaires Disease. It is a violation of Federal law to use this product in a manner inconsistent with its labeling. (1) Shake can before using. (2) Hold six to eight inches from surface to be treated. (3) Spray area until it is covered with a white foam. Allow foam to penetrate and remain wet for 10 minutes. No scrubbing necessary. (4) Wipe off with a clean cloth, mop or sponge. MILDEWSTAT: To control mold and mildew on precleaned, hard, non-porous surfaces (such as floors, walls, table tops) spray surfaces to be treated, making sure to wet completely. Let air dry. Repeat application at weekly intervals or when mildew growth reappears.